For many years there’s been a room at the Moncton Public Library called the Northrop Frye room. Various committees of the Frye Festival meet here on occasion, and we feel right at home. Outside the room is a display case containing copies of Frye’s books. This August we’ve added two items to the display: a clock and a typewriter that were originally the property of Frye’s parents. We think it likely that this is the typewriter Frye used during his years at Aberdeen High School, in Moncton. As such, until proven otherwise, it has the look and feel of a relic of the saint (to borrow a phrase from Michael Dolzani). These items have survived and we have them on display at the library thanks to the care given them over the years by Earl Johnson, who as a young boy in the late 1930s was a next-door neighbour of the Fryes. The library display includes an information sheet explaining Earl’s connection to the Fryes, which I’ve included a copy below. Earl was born in 1933, when his family lived on Dominion Street in Moncton. Sometime in 1936 or 1937 the family moved to 22 Pine Street, next door to Herm and Cassie Frye, the parents of Northrop Frye. Around the time of Cassie’s death in November, 1940, someone in the Frye household gave the typewriter, along with a clock and a set of books, to the Johnsons, hoping they would be put to better use. Eventually they came into Earl’s possession, and he has kept them ever since, as a precious reminder of a long-ago time. 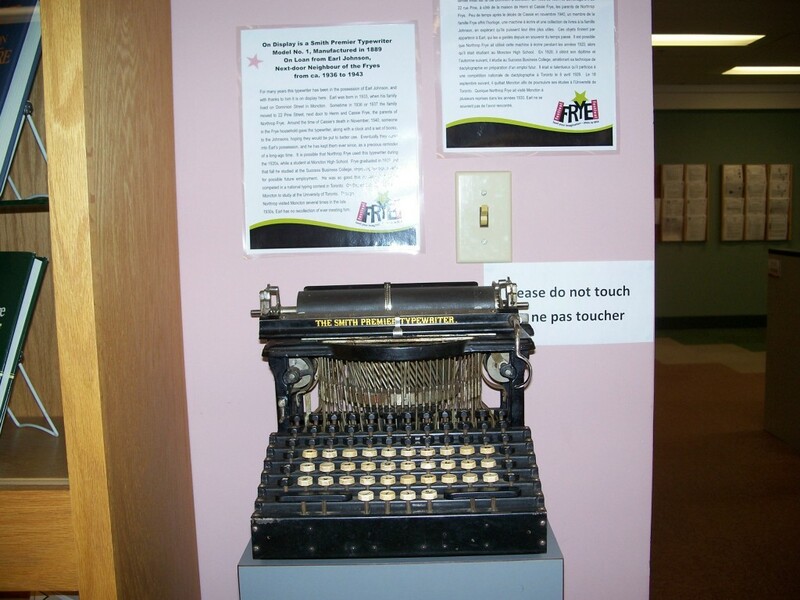 It is possible that Northrop Frye used this typewriter during the 1920s, while a student at Moncton High School. Frye graduated in 1928 and that fall he studied at the Success Business College, improving his typing skills for possible future employment. He was so good that on April 8, 1929 he competed in a national typing contest in Toronto. On September 18, 1929 he left Moncton to study at the University of Toronto. Though Northrop visited Moncton several times in the late 1930s, Earl has no recollection of ever meeting him. After the jump, a photo of the clock. This entry was posted in Biography, News on August 15, 2010 by Ed Lemond. August 15th offers two significant and uncannily symmetrical Macbeth anniversaries. On this date in 1040, Macbeth saw his cousin and rival, Duncan 1, killed in battle, making Macbeth King of Scotland. Seventeen years later to the day, in 1057, Macbeth himself was killed in battle by a force led my Duncan’s eldest son, Malcolm III of Scotland. This entry was posted in Anniversaries, Fools of Time, Shakespeare on August 15, 2010 by Michael Happy.